Freely available modeling and mapping programs that are often open source have become an incredible asset in many environmental science fields. 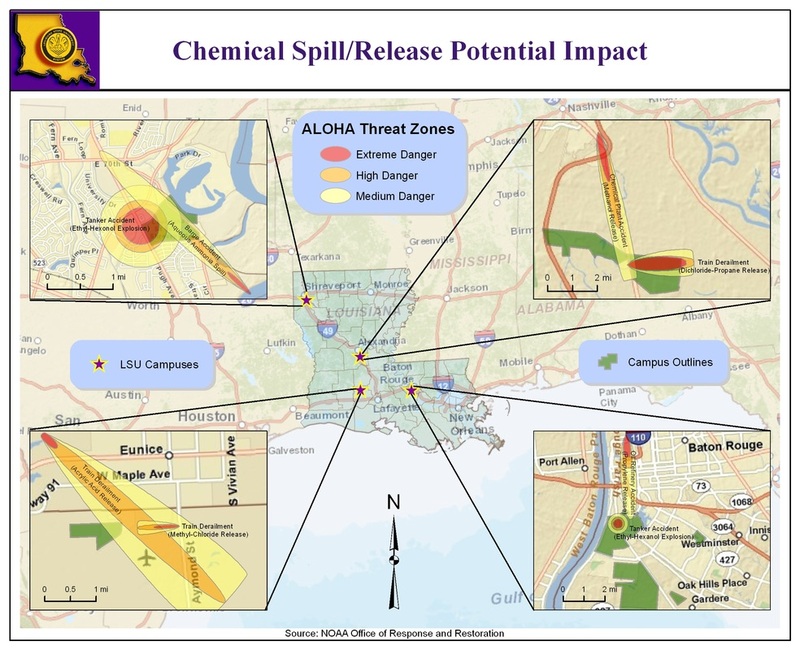 Do you want to model the potential impact of a chemical spill or explosion? Use the CAMEO/ALOHA model that was used in the adjacent map (click to enlarge). Do you want to model sea level rise to see if a coastal area will be flooded based on the a climate change scenario in 2050? Use the SLAMM model. Do you want to model potential economic losses associated with various hazards? Use the models discussed in the "Geohazards" section. Do you want to model the spatial distribution of a species? Use a model like MAXENT or dozens of other models that are part of various R packages. Do you want to map the outputs of these models? Sometimes the models are built into an open source mapping platform like the EPA BASINS model or MARPLOT which is used for the CAMEO/ALOHA models. If a mapping platform is not available, then download one of the platforms listed below in the "Open Source GIS" section. I have used a multitude of free and open source models for many projects and they provide researchers with invaluable toolsets that empower us to perform more complex research than we ever have before. I have used and published results from free/open source models during my undergraduate, masters, and doctoral degrees, as well as in my current position as an assistant professor. During my undergraduate degree when I began exploring the spatial patterns of tropical cyclones in the North Atlantic basin, I employed a spatial statistics program called Crimestat. The program is often used to analyze the spatial and temporal patterns of crime, but it contains a kernel density function and centrographic statistics that were also very useful for tropical cyclone research. While working towards my masters degree, I investigated multiple habitat suitability, species distribution, and ecological niche models that included GARP, MAXENT, BioMapper/ENFA, Domain/Bioclim, and OpenModeller. I used these models on several biogeography/conservation projects as well as spatial epidemiology/ecology projects, and I have also assisted others in implementing the models for lab assignments, thesis/doctoral projects, grants, and other research endeavors. For my masters thesis I employed the GARP ecological niche model to predict the current and future maximum potential distribution of Bacillus anthracis - the causative agent of anthrax - in Kazakhstan. The image on the right (click to enlarge) shows the major rule-sets (i.e., if/then statements) that GARP developed to predict either the absence or presence of B. anthracis on the landscape. Currently, I am exploring many hazards-related models such as HAZUS-MH and ALOHA that have been previously mentioned as well as a water quality-related model (AQUATOX) that was used in a paper published in the journal Environmental Monitoring and Assessment, and the SLAMM sea level rise model that I employed for grant applications for the Louisiana Sea Grant and Mississippi-Alabama Sea Grant Consortium and a MS thesis project. GIS has evolved and the open source revolution has made it accessible to anyone. 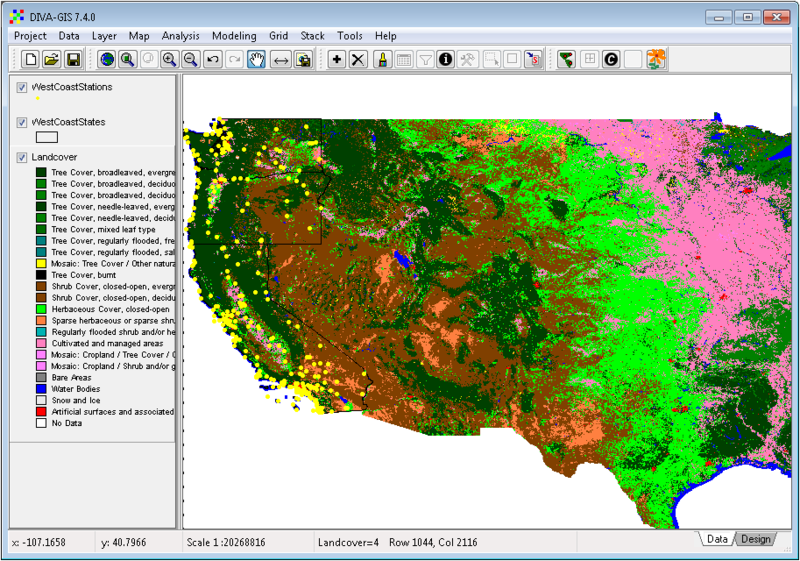 The GIS platforms shown in the three images above are common and very user-friendly open source mapping tools. 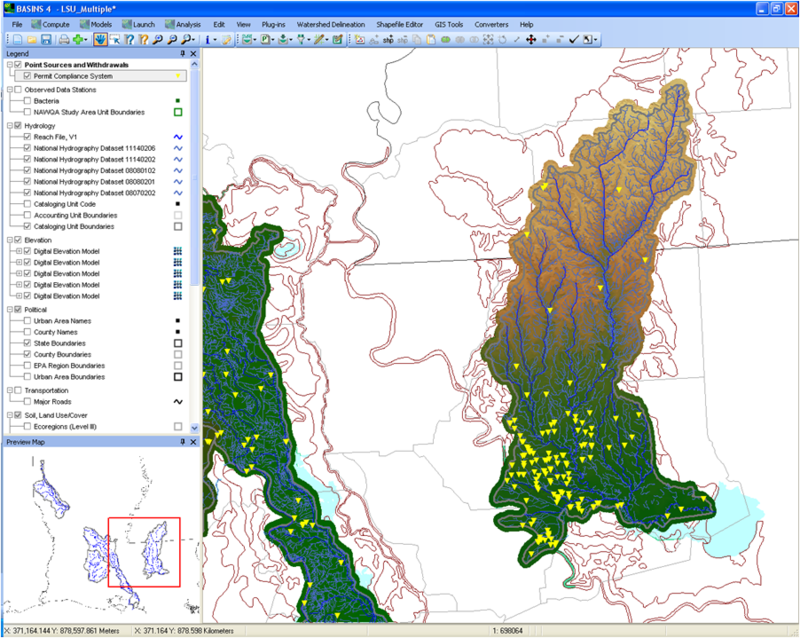 The platform on the left is called MapWindow and the specific version that I have used is part of the BASINS system, which includes a feature that allows the user to download hydrology (Hydro-Plus), soils, elevation, land use/land cover, water quality data, station observation data, transportation, political boundaries, and census data for selected watersheds. The platform in the middle is called QGIS and it has become the most widely-used open source GIS platform. Its functionality and ease-of-use rivals the ArcGIS suite. The platform on the right is called DIVA-GIS and I have used this platform to convert environmental layers and run the Domain/Bioclim species distribution models. The DIVA-GIS website is also a valuable source of free spatial data. GRASS and gvSIG are also widely-used open source GIS platforms. 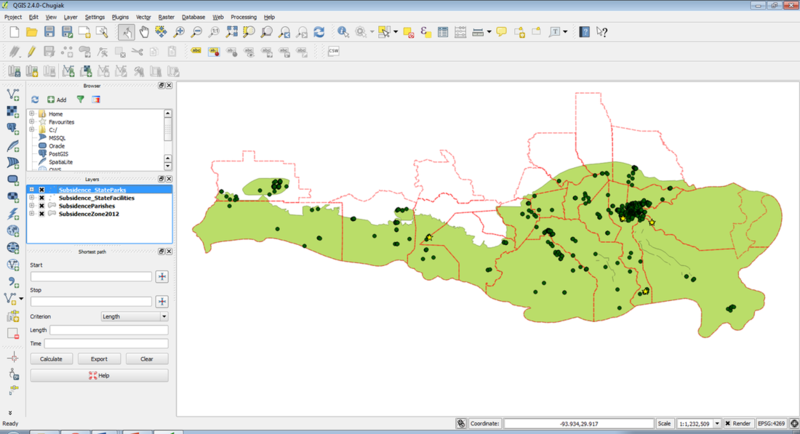 GRASS can be used in conjunction with R independently or within the QGIS interface.